Journal Pinus is a peer review journal published by Research institutions and community service, The University of Nusantara PGRI Kediri. The aim of the Journal is to facilitate scientific publication of the results of researches in Indonesia and participate to boost the quality and quantity of research for academics and researchers. Electronic journal, containing the results of research teachers and lecturers in the field of learning innovation. 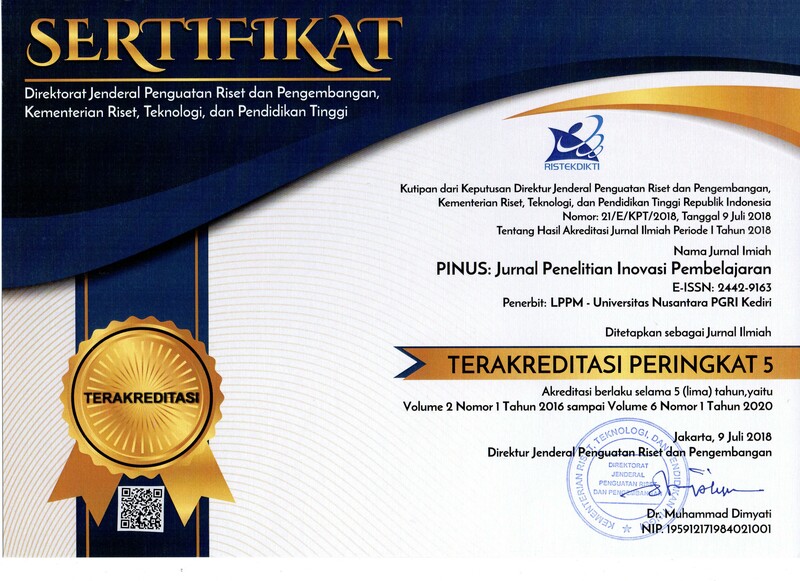 PINUS: Jurnal Penelitian Inovasi Pembelajaran published 1 year 2 times in March and September. Infringements of professional ethical codes (such as multiple submission, bogus claims of authorship, plagiarism, fraudulent use of data, or the like) is forbidden in Pinus. Occasionally, a retraction will be used to correct errors in submission or publication. The retraction of an article by its authors or the editor under the advice of members of the scholarly community has long been an occasional feature of the learned world. Standards for dealing with retractions have been developed by a number of library and scholarly bodies, and this best practice is adopted for article retraction by Pinus. The editor will investigate deeply about the infringements of professional ethical codes. The Pinus Editorial Member will notify the Author(s) about the alleged violation along with its proof and offer the options that can be executed by the Author(s). If the Editor is unable to contact the author within the prescribed period, the Editor will discuss with other Editor and Editorial Advisory Board about this problem. The retracted letter will be issued by the Pinus Editorial Member in two languages (Indonesian and English). The abstract of the article on the Pinus's website is replaced with a statement about retracted of the article because violating the ethical code and/or Pinus policy while the keyword of the article is deleted. The retracted letter of the article will also be published in Pinus on the edition when the letter issued as part of the Front Matter. Every article submitted to Pinus shall use reference management software e.g. EndNote® or Mendeley.